On a frosty Friday morning in Munich, I arrived at the exhibition full of anticipation. In terms of insight into Perugino's influences, I wasn't disappointed. However, I came away feeling that the billing Perugino: Raphael's Master was more a marketing headline than an indication of the central focus of the exhibition. This is superbly ironic, given that this is meant to be Perugino's moment in the sun after half a millennium in Raphael's shadow. Yet in order to draw crowds for Perugino, Raphael's name was invoked, perhaps necessarily. 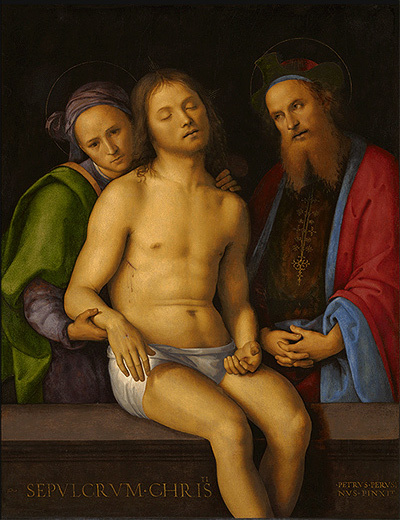 This has been Perugino's posthumous fate, and we poignantly seek insight into his work in this context. For Raphael devotees, the insight into Perugino's influence must be derived from an assumption that he did indeed become Perugino's apprentice, possibly while still a child. The exhibition didn't question this assumption, although acknowledged the lack of firm evidence. The major insight for me, which was very exciting to fully appreciate with the paintings in situ, was the Flemish influence on Perugino's style and on his innovation. A more fitting billing therefore may have been Perugino: Inspired by Memling. This theme is equally interesting and provided an unexpected and fresh perspective. The catalogue is only available in German, but the audio guide was in English, and also available on iPhone. 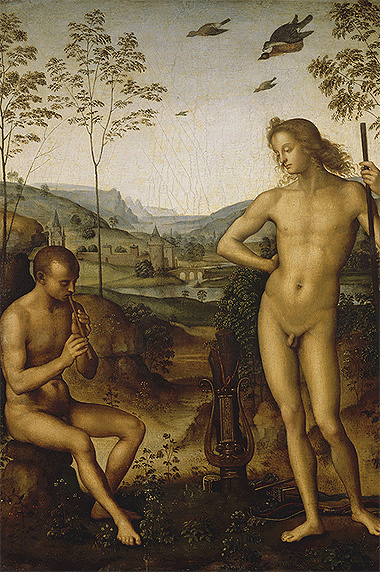 The exhibition opens with the 1568 (second) edition of Vasari's Lives, highlighted as the source of Pietro Perugino's diminished reputation. Contemporary artists held Perugino in the highest esteem and he was known in his lifetime as il divin pittore (the divine painter), a phrase used by Raphael's father, court painter Giovanni Santi. Vasari, however, chose to position himself with the painters he considered the innovators - Michelangelo, Leonardo, and Raphael - and unleashed vitriolic criticism on Perugino's "lack of originality". Vasari further lamented Perugino's lack of real talent, which explained his hard working nature, and the fact that he was only motivated by money. 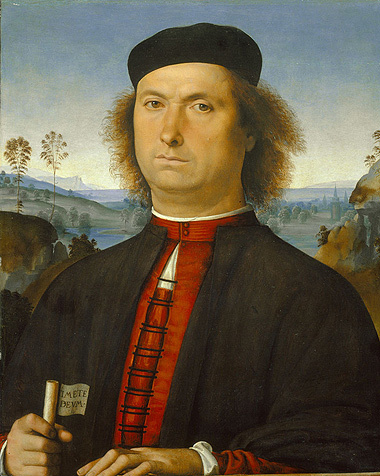 Perugino did experience some criticism late in his career of his habit of repeating popular compositions. He was impervious to this criticism, belonging to a generation of painters who valued craft over originality. When in 1512, Perugino was commissioned to paint an altarpiece "in the style of Raphael" he was apparently unfazed, recognising Raphael's talent, and perhaps taking some pride in his accomplishments. This context is an excellent opening to the exhibition which unveils Perugino as an artist deeply influenced by the trends of the North as well as by his master Verrocchio's studio, which had a reputation for innovations in oil painting. Memling's influence, when viewing Perugino's paintings in person, is clear, especially in his attention to fine detail. Apollo and Daphnis is a remarkable example of the Flemish influence, where the miniaturist detail including the gold highlighting on the leaves and lyre is wonderfully exact and delicate, and quite lost in reproduction. This painting may have been commissioned by Lorenzo di Medici, who suffered from unrequited love. The Flemish influence can also be perceived in his background landscapes, which contribute so much to the vast open serenity of his devotional works. His sparse trees, rocky outcroppings and distant towns are very reminiscent of Memling's. The castle in Apollo and Daphnis is recognised by the curators to be Northern in style if you look closely. The portraits, including the sacred, further adopt Northern innovations. 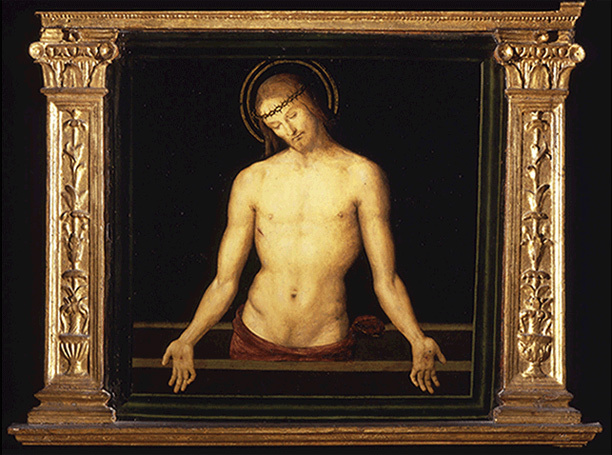 On loan from the State Hermitage Museum is a half length portrait of Saint Sebastian, venerated as protector from the plague. He is featured on a dark background, which at the time was not typical in Italian painting, except in Venice where Messina and Bellini were inspired by Netherlandish artists. Perugino confidently signed his name in gold Latin on the arrow. The upwardly rapturous expression of St. Sebastian was a recurring motif in Perugino's art, which Jacob Burckhardt dubbed the "heavenward gaze". This dates from the time Perugino visited Venice in 1495 and made a series of images on dark backgrounds. I think also of Leonardo's portraits, beginning with The Musician in 1486. The London 2011 Leonardo exhibition catalogue also refers to the influence of Antonello da Messina on Leonardo's approach to portraiture. 2 As Perugino and Leonardo were both known to work in the studio of Verrocchio around the same time, there is a good possibility they were friends. I begin to contemplate if Perugino may have been influenced firstly by Leonardo. Man of Sorrows, a depiction of the risen Christ standing in his sarcophagus is notable for its trompe l'oeil effect of the hands appearing to penetrate the space in front of the painted false frame, a technique which particularly fascinated Flemish artists. The highlight of this series of dark background paintings is the Pietà with St. Nicodemus, also dated 1495. This was one of the standout paintings of the exhibition for me. The perfectly balanced colours have the luminosity of stained glass, a truly Italian celebration of bellezza di colore emerging from an inky black darkness. Colour in shadow is subtly rendered, perhaps again hinting at Leonardo's influence. The parapet bridges the painting and our space, the unfathomable divine world and our world. The centrepiece of the exhibition was Vision of St. Bernhard, one of Perugino's most celebrated works, painted when he was forty. A humble landscape sketch assumed to be in preparation for the background hung adjacent to the painting. 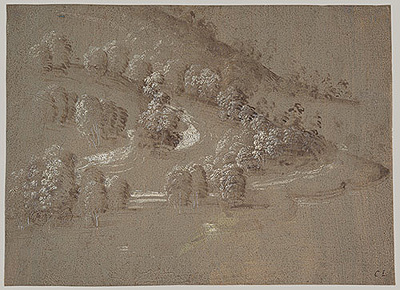 It is one of the first known Italian landscape sketches. In the Vision of St. Bernhard we have the opportunity to contemplate not only the Flemish landscape influence combined with Italian colour, but also the architectural composition Perugino excelled in. The exhibition didn't emphasise the architectural aspect of his oeuvre, but it is something which George C. Williamson was very excited about in his Great Masters Series book on Perugino (first published in 1900 now online). He is convinced that Perugino at some point met and learned from Piero della Francesca, inspiring Perugino's exact architectural structures and their adherence to strict perspective. 3 This work has much to suggest this could well be the case. The arching structure is so precisely and accurately rendered, contemporary viewers could easily believe it was computer generated. Piero's geometric symbolism is present also in the way the structure pulls the viewer toward nature through the arches. St. Bernhard believed meditating on nature was more beneficial than the study of theology. The gaze between Mary and St. Bernhard is linked by the invisible line parallel to the slanted lectern. Even the slightly detached, otherworldly countenance of the figures is reminiscent of Piero della Francesca. This painting exemplifies the quality Perugino was most sought after for - his ability to sink the beholder into contemplative states of mind. The vision of Mary is palpably real, suggesting that all seekers may discover a tangible Mary in their own meditative minds. 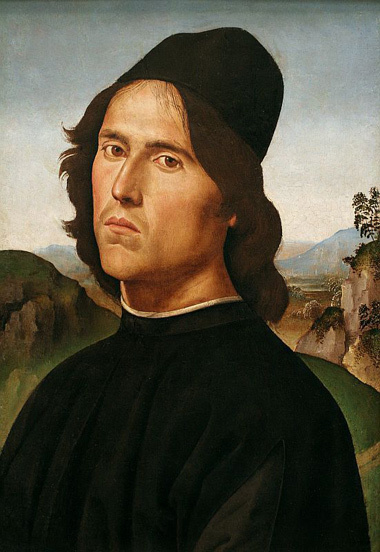 Finally, several portraits were presented in the final room, with a rewarding juxtaposition of the sensitively portrayed friend and ex-colleague Lorenzo di Credi and the fearsome Francesco delle Opere. Memling's influence is overwhelmingly present here. 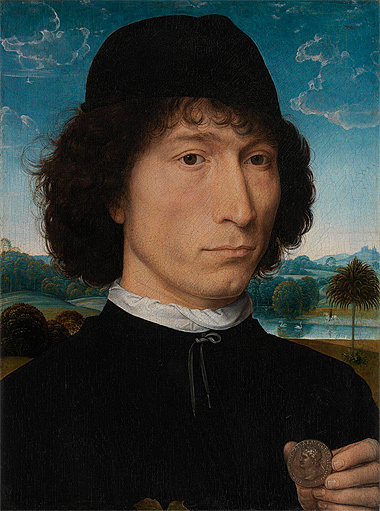 Paula Nuttall, in her book, From Flanders to Florence, discusses the possibility that the Francesco delle Opere portrait may have been directly based on Memling's Portrait of a Man holding a Coin of the Emperor Nero (not featured in the exhibition). The true power of the portrait however, lies in the fearsome expression of Francesco. He was a believer in Girolamo Savonarola's terrifying sermons, indicated on the scroll he clutches. The first two words of a Bible quote, "Fear God, and give glory to him, for the hour of his judgement is at hand" are visible in Latin. This would have been a familiar refrain to Florentine citizens of the time. I don't think I've seen a portrait of Savonarola himself that so effectively communicates the chill wind of this message. Like many great paintings, the impact is greatly diminished in reproduction. In person, it embodies the severity and the fear of Savonarola's world. I am glad to be in its presence, and glad also to meet a painting rather than the man. The exhibition has definitely changed the way I look at Perugino's art. Prior to this I had perceived him as a painter with a uniquely meditative style and exacting technique, shaped by Verrocchio's workshop. This view remains true, but the extent of the Northern influence adds an intriguing dimension, not just for Perugino's art but for Raphael's too. 2. Syson, L, with Keith, L. Leonardo da Vinci, Painter at the Court of Milan. National Gallery Company, London (2011). p.95. 4. Nuttall, P., From Flanders to Florence: The impact of Netherlandish painting, 1400-1500, Yale University Press, New Haven, Connecticutt (2004). pp.221-224. 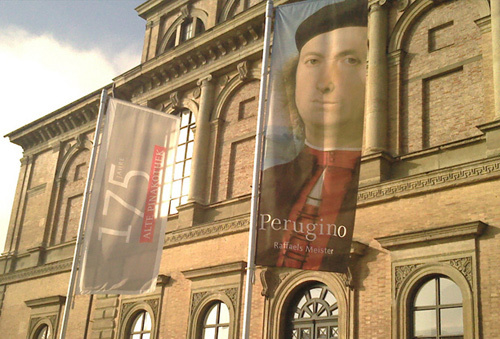 Thanks for a very nice report on the Perugino exhibition. If anything, the exhibition samples verify Vasari's judgment. Raphael consciously set out to exceed his master and did. Frank! You are too kind on Giorgio -- who seems to ignore these earlier lessons Raphael took with him along his entire career. Raphael may have evolved beyond Perugino, but there is something wonderful and sublime in Perugino himself. 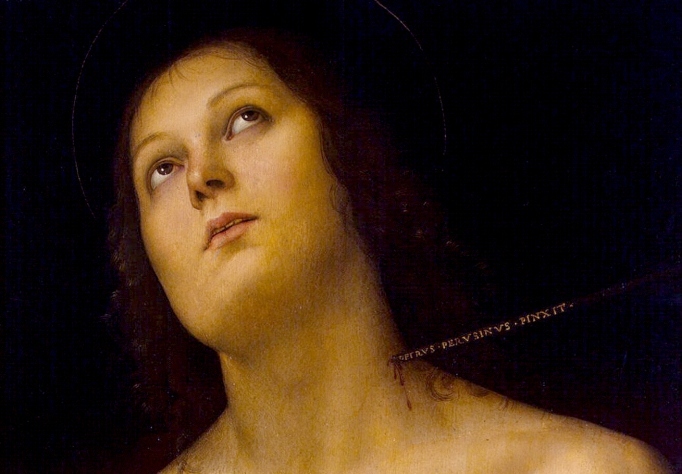 Raphael's Saint Sebastian looks like a serene dandy compared to the intense 'heavenward' gazing version by his master (in more than one version). 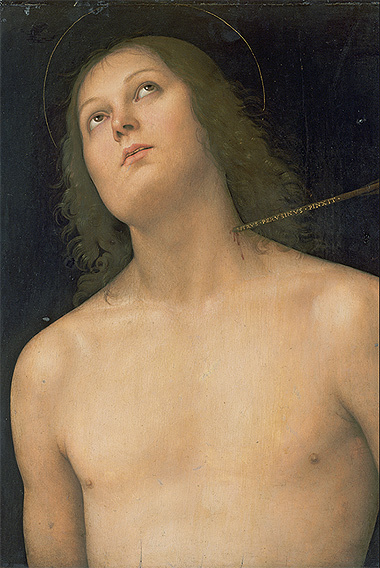 Which we prefer is up to the viewer, though Saint Sebastian as a serene figure does not do his story justice. It has been suggested by a few observers that Raphael could never render a great intensity of emotion, in this respect it could be argued that he could not match any of the great masters he gleaned lessons from during these formative years. Apart from the visual indicators, I wish we had more meatier evidence of their time together. One gets the impression that Perugino never thought ill of his pupil. I often wonder how much of this "student surpasses" master actually occured. It seems to be lifted from an ideal, be it from Alberti's musing on the ancient painters, or even Leonardo's own notes onm painting. Vasari seems to be channeling this idiom in his accounts of various star pupils exceeding their masters. I'm just going to go out on a limb and say that I'm not completely convinced of Raphael's undisputed supremacy. The exhibition wasn't really a show of blockbuster works, so I can see why it wouldn't necessarily sway disbelievers. 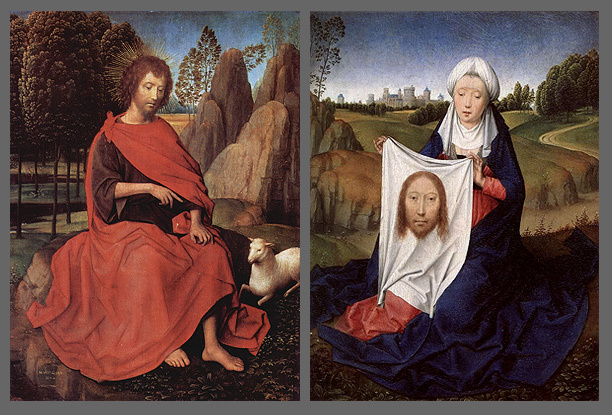 But the Memling angle is interesting in that it gives some depth to Perugino's trademark 'stillness'. In this sense, he sits with Piero della Francesca and Jan van Eyck rather than the more animated later painters favoured by Vasari. I suppose this animation may be seen to be more 'humanist' and therefore more 'progressive' in the Renaissance context. But this ability of his art to pause the mind for a moment resonates for me and I suspect many contemporary viewers who normally are operating at quite a frenetic pace. So maybe he will experience more of a revival - I hope the Munich exhibition is only the first. Great point Glennis. As much as I adore Raphael, Perugino has been in Raphael's shadow for too long. He very much desrves to shine by the strength of his own talent, and not just his student's legacy. I hope that exhibition travels, and we get an English catalogue! Perugino is one of my very most favourite painters so it's great to see him get a bit of recognition! From Ingres to Bouguereau (with notable exceptions!) to Godwin, any great painter who shuns the "animation" of Michelangelo in favour of classical restraint and rigorous compositional harmony owes a great deal to Perugino. I would disagree about the show not containing any "blockbusters" - that Saint Bernhard is exceptional! One day we'll look back at our modern art and realize what it was most lacking - repose. Welcome to 3PP Joshua - great points! I agree that capturing stillness was equally important - it makes me wonder how much Giorgione or Titian knew of Perugino - who also excelled at portraits and scenes of figures in contemplative poses. Thanks for reading and commenting Joshua. I thought of your comment yesterday at the excellent Vermeer's Women exhibition in Cambridge. A sense of contemplation within domestic repose was expressed in many of those paintings. The scale and drama that I might associate with blockbusters (and I agree the Saint Bernhard is definitely a blockbuster - one of the greatest I've ever seen) was absent here in favour of a quiet intimacy every bit as powerful. What a priviledge to see both shows back to back. Not a problem Glennis! Just reading through your website now, definitely going in my bookmarks. :) I think what annoys me most about the underrating of perugino is just what a great portraitist he was. If we go by the cliche, perugino created a "formula" that became tired and stale and it was up to Raphael to invigorate the formula with "realism". You really only have to look at the two portraits above (though there are other great ones, this is a favourite http://upload.wikimedia.org/wikipedia/commons/d/df/Pietro_Perugino_cat14.jpg) to see just what a skilled draftsman he was. Perugino is one of the most prominent examples I can think of of putting a good story (young heroic painter excels his provincial master and goes on to better things) before good taste. He certainly isn't the only casualty (vasari springs to mind, but that's another, longer story!) of art history. By the way, the more you look at that portrait of della opere, the better it gets! @Joshua - great points about Perugino as a portraitist, another factor of influence which he bestowed on his students. 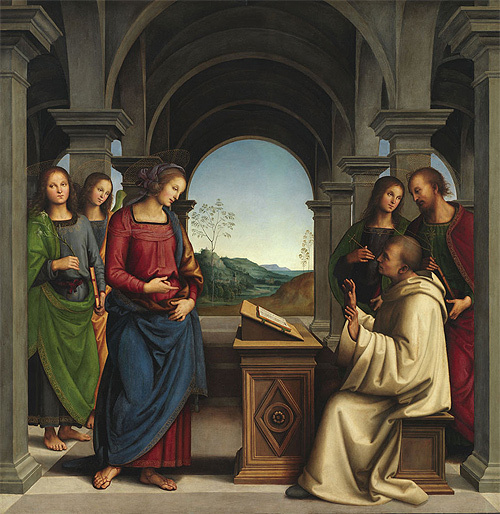 Raphael of course took some important lessons from the Florentine Masters (and later connections in Rome) but the foundation was arguably built by his exposure to Perugino. I've always been fond of the Uffizi 'Portrait of a Young Man' pic I've often wondered if Raphael saw this/similar works and how it may have influenced his own portraits, whose subjects seem to directly address the viewer in a similarly engaging manner. *Just a note, I actually meant to write Godward in my first comment, if you haven't heard of him check him out please! One of the last truly great classicists of the victorian era.